Last updated by Frankye at November 8, 2013 . Office Safety: winterize your office to protect your floors, guests & business. Winter months bring messy winter weather. Office Ink can’t offer you better advice than “bundle up” to stay warm, but we can give you some tips on keeping your business safe, clean and neat through the onslaught of messy weather. Invest in a good floor mat to protect hard floors and carpets from winter snow. The best way to keep the floors in your office free of corrosive – and slippery – snow melt is to invest in a good floor mat. If the entrances to your business is covered, or if your building has a vestibule, you can go with an outdoor floor mat. Crown makes great outdoor floor mats your guests can use to remove snow and debris from their shoes. You’ll need a good indoor floor mat if you don’t have a covered entrance or vestibule. Again, Crown has you covered with attractive, effective indoor floor mats. For more tips on floor mat selection, check out the floor mat guide in the OnTimeSupplies.com Knowledge Base. Don’t wait to vacuum tracked in salt and debris. If your office is carpeted, winter is a good time to invest in a good vacuum cleaner. You and your guest will track salt and debris into your business. Get a vacuum cleaner that will pick it all up in a single pass. This lightweight Electrolux vacuum cleaner is designed with commerial cleaning in mind. It picks up debris so well, they use it in hospitals. Once again, OnTimeSupplies.com offers great prices on Electrolux vacuums. Best of all, you get free same day shipping if you order online now. These discount office supplies and cleaning products from OnTimeSupplies.com will keep your office safe and looking good all winter long. What to look for in day planners & appointment calendars. It’s amazing how much you can get accomplished when you go in with a plan. Good time management is the key to success in any project. Nothing helps you stay on task better than an old fashioned day planner. The approach of the new year is good time to pick one up. You’ll find lots of deals on 2011 calenders and planners at OnTimeSupplies.com. Day planners are available in daily planner, weekly planner and monthly planner styles and fall under two main categories. Office Ink shows you which style of day planner will best meet your needs. 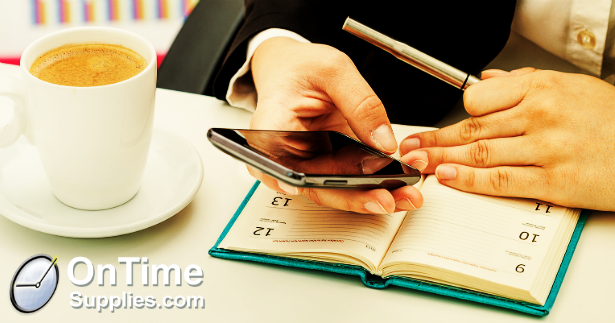 Day planners with an appointment calendar, or appointment books, help you organize your work day. Whether you manage a salon or an executive’s schedule as an assistant, you want your appointment book to have the same features as a regular day planner, with the added benefit of an an hourly appointment calendar. space for jotting down notes and reminders. If your day planner doesn’t have adequate space for notes, it will become filled with short, cryptic scribblings and cramped, illegible handwriting. With ample note taking space, you’ll be able to actually read your notes instead of trying to divine their meaning. a section for telephone numbers and addresses. You haven’t memorized anyone’s telephone number since you bought your cell phone ten years ago – not your boss’, not your best client’s, not your kid’s. Use your day planner to back up important contact info in your day planner. large calendar pages for at a glance viewing. Your day planner should be convenient to use and consult, otherwise you won’t use it. relevant calendar, i.e. public school calendar or other academic calendar, fiscal calendar, etc. Whatever your business demands. AT-A-GLANCE, Day Runner, DayMinder, Day-Timer, and FranklinCovey all make great 2011 day planners and appointment books that will help you stay organized all year long. Order now at OnTimeSupplies.com to get same day shipping, and to get a jump start on an organized new year.